What Is An Epidural Steroid Injection And Who Is A Suitable Candidate? Mar 26 Comments Off on What Is An Epidural Steroid Injection And Who Is A Suitable Candidate? This is a common procedure for treating inflammation related to low back related leg pain, or neck related arm pain. In both of these conditions, the spinal nerves turn out to be inflamed because of tightening of the passages where the nerves travel as they go down or out of the spine. Why There Is A Need Of Epidural Steroid Injections? Tightening of the spinal sections can result from a range of causes, this includes disc herniation, bone spurs, thickening of the ligaments in the spine, joint cysts, or even unusual arrangement of the vertebrae. The epidural space is a fat filled that involves the spinal sac and gives cushioning to the nerves and spinal cord. In this case, steroids put into the epidural space have a strong anti-inflammatory response that works in a way to diminish pain and enable patients to improve mobility. In spite of the fact that steroids don’t change the fundamental condition, they can work in a way to break the cycle of pain and inflammation and enable the body to compensate for the condition. As a result, the epidural steroid injections can give benefits that outlast the impacts of the steroid itself. A tightening of the spinal canal and nerve root canal can result in back and leg pain, particularly when walking. A weakness or fracture in the middle of the upper and lower facets of a vertebra. In the event that the vertebra slips forward, it can compress the nerve roots resulting in pain. The gel-like material inside the disc can result in bulging or rupture through a weak zone around the wall. Irritation, pain, and swelling happen when this material crushes out and interacts with a spinal nerve. A breakdown or aging of the intervertebral disc resulting in the breakdown of the disc space, tears in the annulus, and growth of bone spurs. Pain that progresses along the sciatic nerve in the buttocks and down the legs. It is normally resulted by compression of the fifth lumbar or first sacral spinal nerve. The utilization of epidural steroid injections has demonstrated positive outcomes for certain patients in the treatment of painful inflammatory conditions. 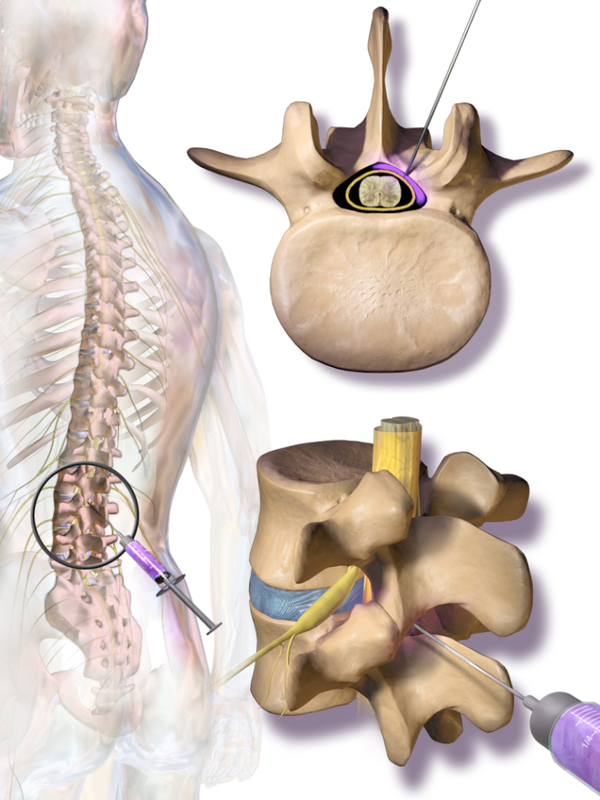 The injections can likewise help decide if surgery may be advantageous for pain related to a herniated disc. At the point when symptoms meddle with rehabilitative activities, epidurals can work in a way to ease the pain enough so patients can proceed with their physical therapy.